Do you have Windows 8 installed and are thinking about tweaking its performance? Or have you installed many apps and softwares and now the question “Would this effect the performance and booting speed?” is clicking in your mind. Well today let’s see how to tweak the performance of Windows 8. We all know how certainly fast Windows 8 is compared to earlier version of Windows like 7 or Xp. 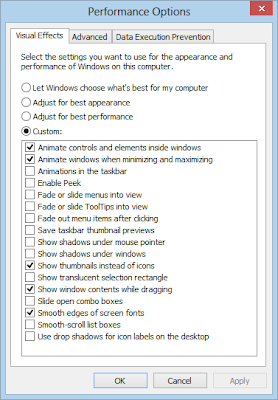 The following tweaks or methods will certainly speedup your windows 8 performance even faster. This is the most easy Tweak. Just open the Charging Power Settings by accessing the Control Panel and set the option to “Set to High Performance”. Now, whenever your computer boots it analyses and reads Startup Programs on Startup. Some Programs get enabled at Startup by default on installing them. Such type of Programs increase the time your computer takes while booting. Take the following steps to disable them on Startup. Note: In previous Windows versions the startup items list was present in system configuration manager which can be accessed using msconfig command. But Microsoft has moved the startup items list in Windows 8. 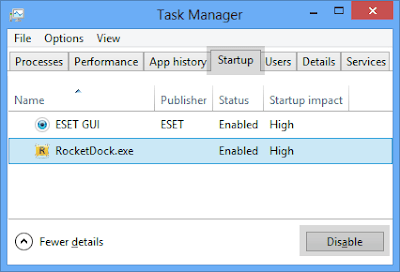 Now it can be accessed using Task Manager. You can open Task Manager by pressing "Ctrl+Shift+Esc" keys together. Now go to "Startup" tab and here you can click on the unwanted item and click on "Disable" button to remove it from startup list. You can start these programs again by manually selecting them. Throughout your life you install so many Programs and then Uninstall them. But these programs leave behind the registry keys like the breadcrumbs for Windows. The Windows reads or goes through these registry keys every time. So you therefore, need to cleanup these registries using a registry cleaner. It will not consume much of your time. Here is the Registry-script which will tweak some settings in Windows 8 Registry to make Windows faster. It will reduce timeout values, set Windows to automatically end not responding tasks, make menus to show faster upon clicking and tweak various other settings. Just copy and paste this in Notepad and save this as registryspeed.reg. Then Open this file and Click yes when UAC dialog opens. After that again click yes to install these settings. Decrease menus show delay time. After that When you click the menu, it will open faster. Windows 8 comes with lots of candy features. It will show animation effects even while minimizing and maximizing a window or closing programs. 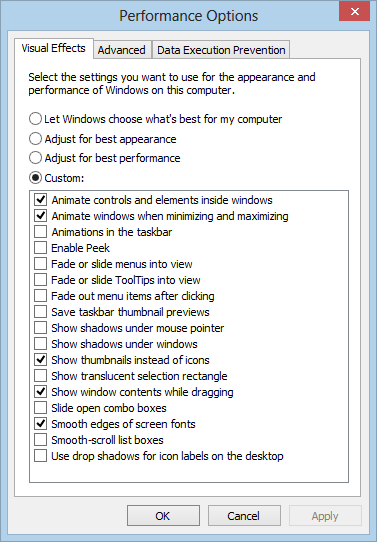 These candy features might amaze you but they You can disable these animation effects for tweaking your Windows 8. Note: Here is the list of animations which you need to disable.